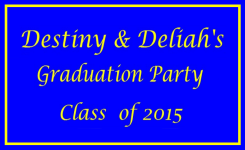 Double the congratulations and double the fun as Destiny and Deliah celebrated being part of the CLASS OF 2015. Congratulations girls! We all wish you the best in whatever you do in the future. You have the world at your feet and you will do great things. Masters Memories was there to capture some wacky memories as there was never a dull moment at the photo booth.